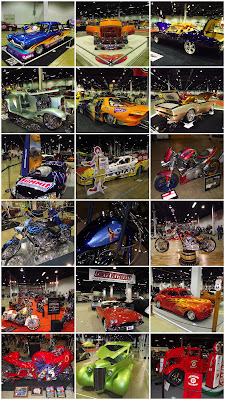 The Kurman Communications team was lucky enough to organize today’s media preview of the 48th Annual O’Reilly Auto Parts World of Wheels at the Donald E. Stephens Convention Center in Rosemont, Ill. (5555 N. River Rd.) The show opened to the public this afternoon at 3 p.m., and runs through Sunday, Mar. 7. It’s the first time the show has been held at the Stephens Convention Center, and what a change! It’s nearly twice the amount of space as previous shows, which means more custom cars, cycles and booths for you to browse.